Human activities have impacted wildlife animals throughout history. As human civilizations have become more modernized and complicated so have the lives of the wildlife that have no choice but to share the space with us. In the urban setting, raccoons face the challenges of adapting to high traffic zones and loud human activities among other things. Even the animal’s diet is affected by life in the city. 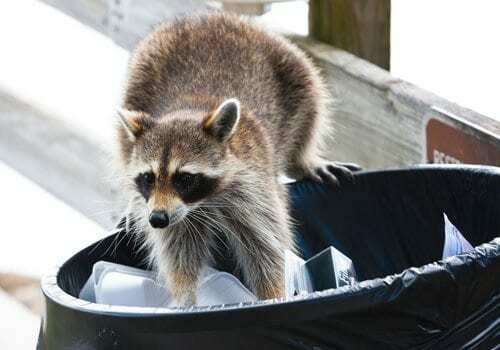 The fast food discarded in cities becomes food for wildlife animals like raccoons. As a result city raccoons consume more fats and sweets than their rural counterparts. The result is that raccoons have more body fat than rural raccoons and they are also exhibiting signs of hyperglycemia. This is an expected result considering that the same diet among adults is leading to high levels of body mass as well as diabetes and obesity. Scientists in Sudbury’s Laurentian University have discovered that the sources of raccoons’ meals have a direct correlation with the size and health of the animal. The study that yielded these results focused on three groups of raccoons. The groups frequented three different areas and as such consumed a different diet. One group of raccoons residing in a primarily farming area had a diet that closely reflected the diet of true wildlife raccoons as they had limited access to human waste. Another group living at the Toronto zoo consumed fast food leftovers. A third group lived in a conservation area and had moderate access to human food. According to evolutionary ecology professor and lead author of the study, Albrecht Schulte-Hostedde, the results showed that the raccoons that lived in the city had the highest levels of body fat and blood sugar levels and those who lived in the farm area and as such had the least access to human food had the most normal levels of body fat and blood sugar levels. The researchers have been quick to explain that they have not yet associated these conditions with any illnesses among raccoons. 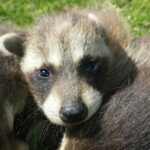 Wildlife experts are predicting that the city raccoons could soon face reproductive and survival challenges and they continue to monitor the raccoons to determine this. The city also denies raccoons of their natural habitat. Instead of living in their natural environments –thick woodlands with rivers nearby- raccoons live on streets populated by buildings and vehicles. Instead of dark nights with only stars and the moon for lighting, city raccoons face bright neon lights of commercial signs and the glaring lights of the headlamps of vehicles. Raccoons that live in cities are less likely to be apprehensive around people. One of the things that keep wildlife animals safe is their tendency to stay away from people. The fact that raccoons in the city do not shy away from people puts them in harm’s way. Since they often have to navigate through heavily trafficked streets, many of the city’s raccoons are still at risk of dying as a result of road traffic. Clearly, we should all be concerned about the safety and well-being of our city’s raccoons. But that doesn’t mean we’ll welcome their intrusion into our domestic space. What it does mean is that we should take the humane approach to raccoon prevention and removal in Ajax. This humane approach happens to be the specialty of experts like Skedaddle. 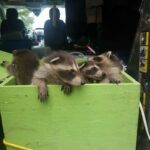 Skedaddle ’s experienced and knowledgeable wildlife technicians will inspect your property for raccoon presence, remove the animals along with all traces of their presence and implement preventive measures to deter them from re-entering your space.